Burger King and Chipotle Mexican Grill have both unveiled significant new programs aimed at increasing traffic and loyalty. BK is betting that offering consumers coffee at just 17 cents per cup (based on a 30-day month) will increase breakfast traffic and and wrest some share away from dominant breakfast player McDonald’s, not to mention Starbucks. Indeed, BK’s launch video for the program (below) points out that it’s offering a full month’s worth of daily coffee for the price of one large cappuccino from Starbucks. This seems a no-lose concept for Burger King. A relatively small loss of profit on cups of coffee is bound to be covered by incremental breakfast food sales from more people coming through the doors and drive-throughs to redeem their coffee subscriptions. Further, the deal is on a continuous service basis — meaning that users will continue to be charged on their credit cards or other supplied payment methods each month, unless they cancel. And as all direct marketers know, that means that many people aren’t likely to think to cancel, even if they end up not using the subscription much. Signing up is only through BK’s app. Subscribers agree to provide BK both with a payment method and personal information at registration, and to update that information as necessary — a bonanza from any marketer’s perspective. Once someone has the app, they are of course targetable for other BK offers. 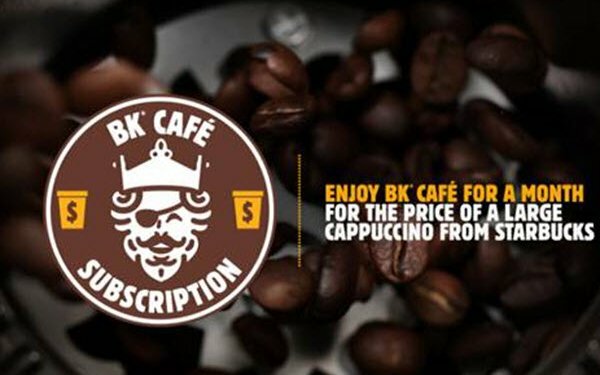 And of course, BK reserves the right to change the coffee subscription terms at any time, including the fee (it will give 10 days’ advance notice if the price is rising). Consumers win, too, if they do get to a BK to redeem at least a few cups of coffee per month. Under the deal terms, each day’s coffee expires at day’s end. If you cancel with days left over in a given month, you can use those days, but there are no prorated refunds. Meanwhile, to promote its new rewards program, Chipotle has become among the first brands to use Venmo payouts to engage with customers, according to CMO Chris Brandt. Reason: Chipotle is one of the most-mentioned brands on Venmo, an app that lets friends share payments through its social feed. The restaurant chain used the Venmo payouts to give away up to a quarter of a million dollars to about 25,000 Chipotle fans per day between March 12 and 15. For a chance to win anywhere between $1 and $500, consumers submitted the phone number associated with their Venmo accounts at ChipotleRewardMe.com. Within 24 hours, recipients of the payouts were alerted of the payment in the Venmo app, with a note from Chipotle and a custom Chipotle pepper emoji. Tressie Lieberman, vice president digital and off-premise for Chipotle, tells Marketing Daily that the brand will, over the next month, also be rolling out a campaign for the rewards program that will include TV, cinema and digital ads, and performance media. As for the rewards program’s terms, those who register through the Chipotle app or the brand’s site earn 10 points for every $1 spent in the restaurant, online, or in the app, and earn a free entrée on reaching 1,250. Members get “surprise” birthday rewards, and bonus points through promotions such as extra point days. New members will also get free chips and guacamole with their first purchases. Back in 2016, Chipotle ran a three-month program, dubbed Chiptopia, that rewarded customers based on visit frequency instead of dollars spent, and offered terms that were extremely generous in comparison to industry norms. “Chipotle ended up paying out roughly $20 million to more than 85,000 Chiptopia members who qualified for its largest prize — meal catering for 10, valued at about $240,” reported Business Insider. To develop its new rewards program, Chipotle used feedback from Chiptopia and last year ran a six-month pilot in Phoenix, Kansas City (in both Kansas and Missouri), and Columbus, Ohio. 1 comment about "BK Intros $5 Per Month Coffee Subscription; Chipotle Uses Venmo Promo to Launch Rewards". baohiem bidv from baohiem, March 18, 2019 at 1:50 a.m.